What Is Grogged Pottery and Why Is It Used? What Is Grog in Pottery? Grog is clay which has been fired then ground up. Grog can come in many particle sizes, from fine to coarse. It is used to reduce shrinkage in clay bodies. The best size of grog for most purposes is a 30/80 mesh. This means that the grog is small enough to go through a screen with 30 openings per inch, but is too large to go through a screen with 80 openings per inch. Commercially available grog almost always has some iron in it and may not be suitable if you want a pure white clay body. For hand building, grog in a clay body reduces the shrinkage and makes it less likely that a piece will crack during drying and firing. What is grog actually made from? Grogged clay usually contains a high percentage of silica and alumina. Silica is found naturally and is one of the highest components found in sand. Silica is found as quartz, which is the ‘second most abundant mineral in earth’s continental crust’. Alumina, which is also found in grog, is made up of a chemical compound of aluminium and oxygen. It comes as a closely packed structure. A great definition of grog, from Tom Butcher Ceramics, is that it's 'pre-fired pottery, that has been ground down to varying degrees, with textures ranging from flour to granulated sugar. How does grogged clay make a piece less likely to crack? Are there any other reasons grog is used in clay? As well as improving drying, it can also improve drying shrinkage. All ceramics shrink by around 6 percent when they are drying; this when the water leaves the clay. The size of the particles in the clay determines the size of the shrinkage and clay with grog in has much larger particles. While drying shrinkage, it can help reduce firing shrinkage. 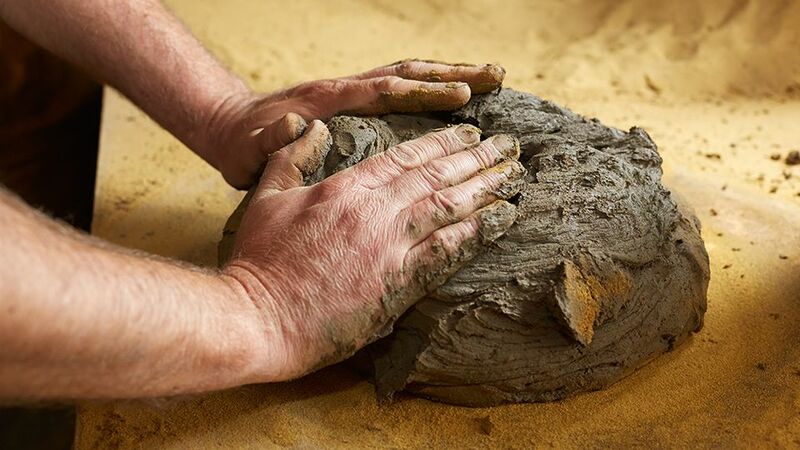 Grogged clay can also help reduce thermal expansion, which means a lower chance of expanding and contracting, when it’s being heated in the kiln, which will mean a lower chance of it cracking. The coarse particles also escape easily during the firing process. The workability of a clay with grog in, also tends to be higher. What is grog best used for? The larger particle sizes in grogged clay mean that it’s great for sculptors, as the clay tends to hold its shape much better. It’s also good to use on the wheel, but you’ll need to be aware that it can be quite abrasive on your hands when you are throwing. Grog also plays a key part in the history of ceramics and determining how the pots were made, using which materials over the years. They play a huge part in ceramics' evolution. How does grogged clay affect glaze? Grogged bodies for clay can affect the ways in which the glazes turn out, as the materials of the clay can react with the chemicals in the glazes. Grogged clay is also good for firing, as it is better for expanding and contracting without cracking. Grog can also add a brilliant texture to your pottery and ceramic pieces. The temperature in which you fire your grogged clay should also be a consideration, as grogged clay can often fire quite a lot quicker.